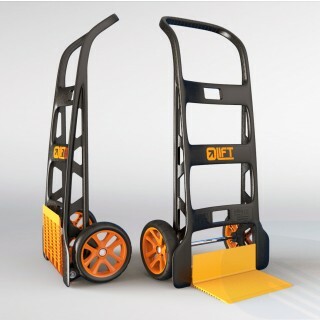 OLIFT: it’s an innovative product that revolutionizes the concept of transport cart as a means of internal transportation. It is a transport cart in monocoque made on Propylene material. Designed by architect Cesare Monti , the Olift (this is his original name) is the result of numerous studies and researches were born many considerations and notes dictated by the users as a means to facilitate their job. Lightness, ease of use and maneuverability are showing this product like a true revolution in the professional field. Soft and essential lines, handling and load capacity make it suitable for any use, its portability and its exceptional strength make this product unique and original. The transport cart (studied on 3D models and with the aid of computational analysis) is made in monocoque with injection of plastic materials reinforced with glass fiber thus allowing extremely high values of strength and stability. 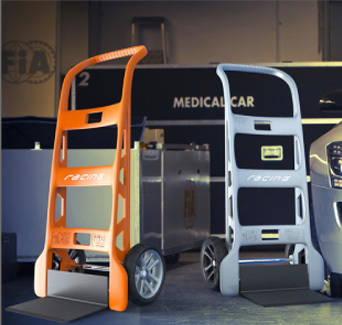 The Transport Cart Olift is available in three series of colors and can be customized on request in both color and label associated to the brand . For the hospital service it was made a version suitable for use in the department: the presence of metal structures in stainless steel allows it to be totally non-magnetic . Transport Cart Olift is then distributed by ” Carrelli.it ” Castel Mella (BS) within the site you will find technical specifications and detailed descriptions than 1000 different products for the transport of goods.